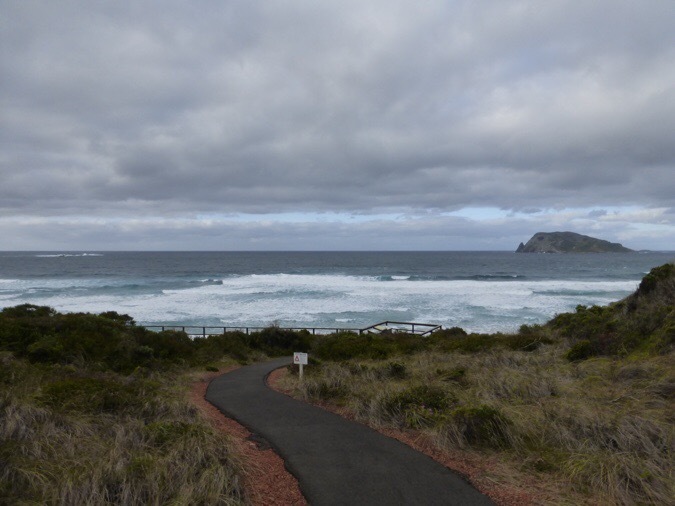 Day 22: I’ve Reached The Coast! Oh what difference a day makes! I had a great night of sleep and awoke to mist falling on the tent. I took my time getting ready and it fortunately stopped as I headed out at 6:45am. I knew I could hear the ocean, but I hadn’t looked ahead and thought my first real beach walking was still another day away. Then, less than 30mins into today, I turned a corner to see this! The trail took the path right down to the beach and I had it all to myself! It was amazing and was so uplifting after all this rain and being in the forest. Especially, because I totally didn’t expect it today. I felt like I was soaring as I got to walk for about half a mile (one kilometer) on the beach before turning back off. It was a taste of what’s to come and was an awesome way to start the day today! 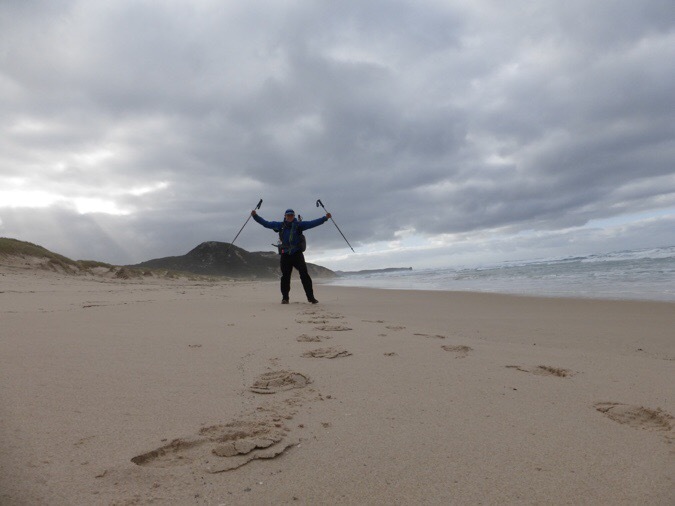 After turning off the beach, I was introduced to the other main terrain that will be prominent in my final week on the Bib, sand dunes. 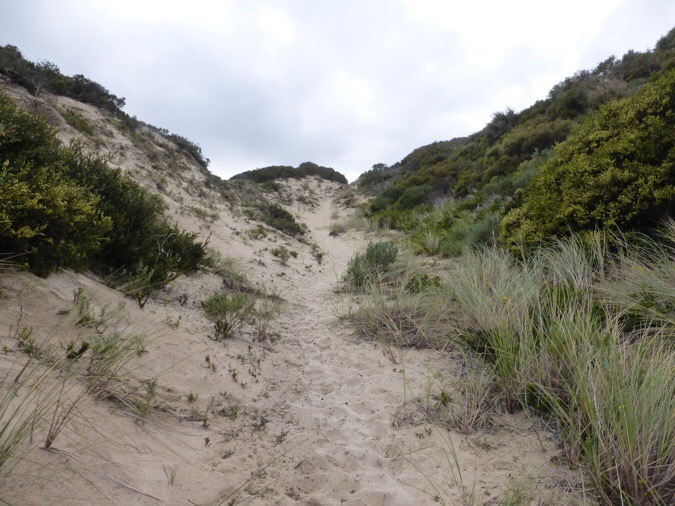 As I hike along the coast, I will be hiking in deep fine sand with a lot of rolling ups and downs. It is quite taxing and I’ve figured this into my final week’s mileage so I can do shorter days on the more tiring terrain and really enjoy this coastal section. Deep sand and steep ups and downs of the dunes. 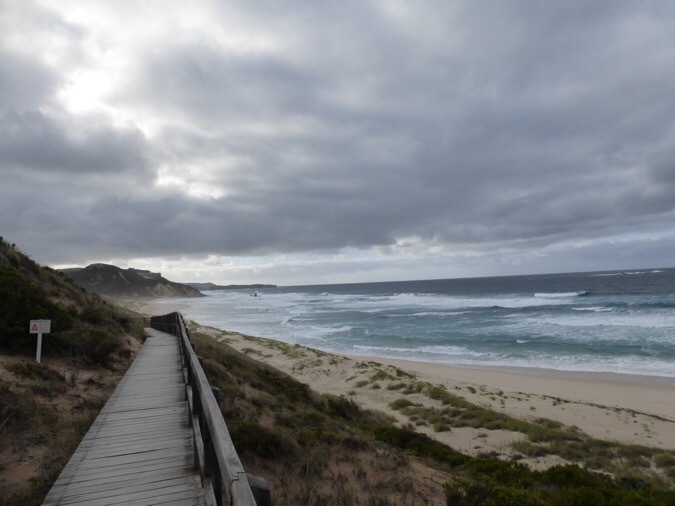 Although today did not take me back down to the beach, I still got to spend the morning on the dunes with ridge walks that had great views of the coastline. 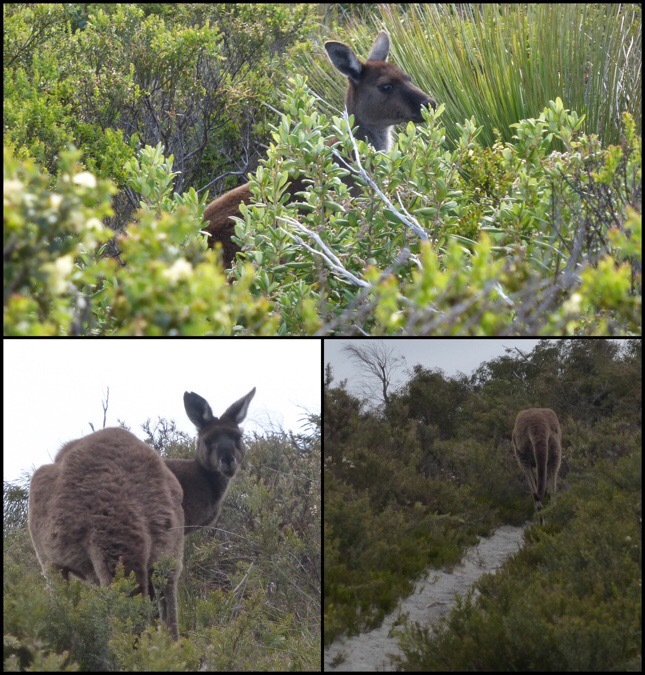 Plus, there were still kangaroos, which was so surreal to be along the ocean and then see a kangaroo. I finally got a shot of one bouncing down the trail. Halfway through the morning, I came upon an American couple I knew was just ahead of me also doing an end-to-end. Tom and Becky are the first hikers I’ve come across going the same direction as me that were hiking at the same time as me, so I actually hiked with someone else for the first time all trail! They were really enjoyable to talk to. Tom is actually from Washington state and lives just a couple hours from me in Portland. Small world! 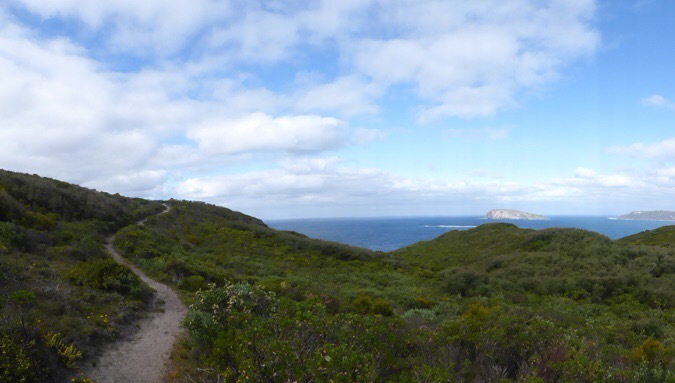 I hiked on ahead after a bit, anxious to get to town and we saw each other later at the hostel. Tom is also one of the few to have hiked extensively in the Grand Canyon, so it was fun to remember the Hayduke and where I went in there. Tom loves the Grand Canyon and will be rafting it this winter. 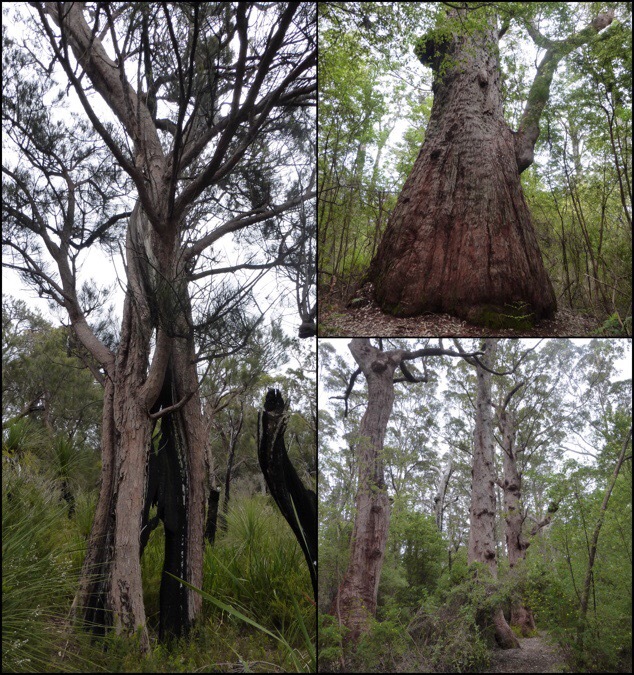 After the morning coastal views, the second half of the day returned to the forest, but it was a new forest with another rare tree only seen right in this area, the red tingle. I’ll be visiting more places with them and will even do a cool tour to walk up high among them in a couple days. They are unique because they have some sort of shallow root system and they grow in a way that if there is a fire, the center can get burned out and the tree still survives. They are pretty cool. The end of the day led into Walpole. It was quite level and not deep sand. 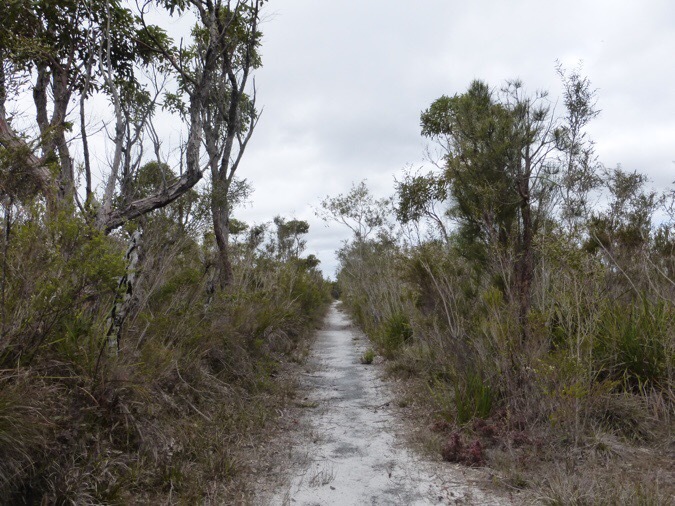 It led to a nice walking trail that was along an obstructed inlet and walked right into town. I made it to town at 3pm, which was perfect because it is a Sunday and everything was closing early. I am needing to do a full day out tomorrow, so I was able to get to the grocery store for a few things, do my laundry, and eat pretty efficiently. 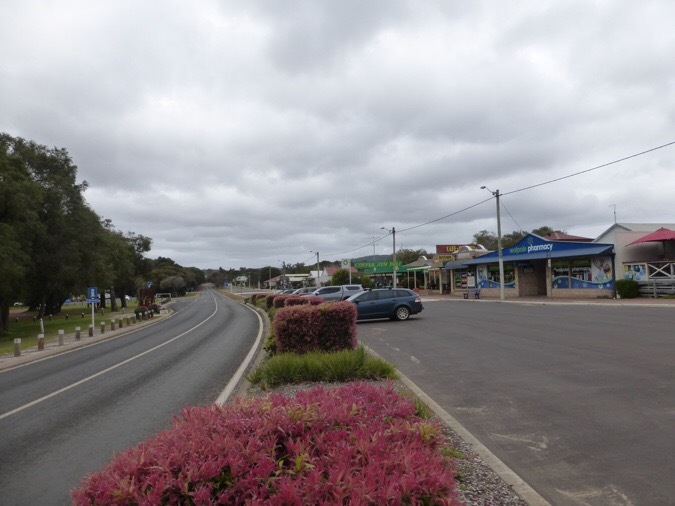 It also helped again that the main drag of town was again, much less than a mile long. 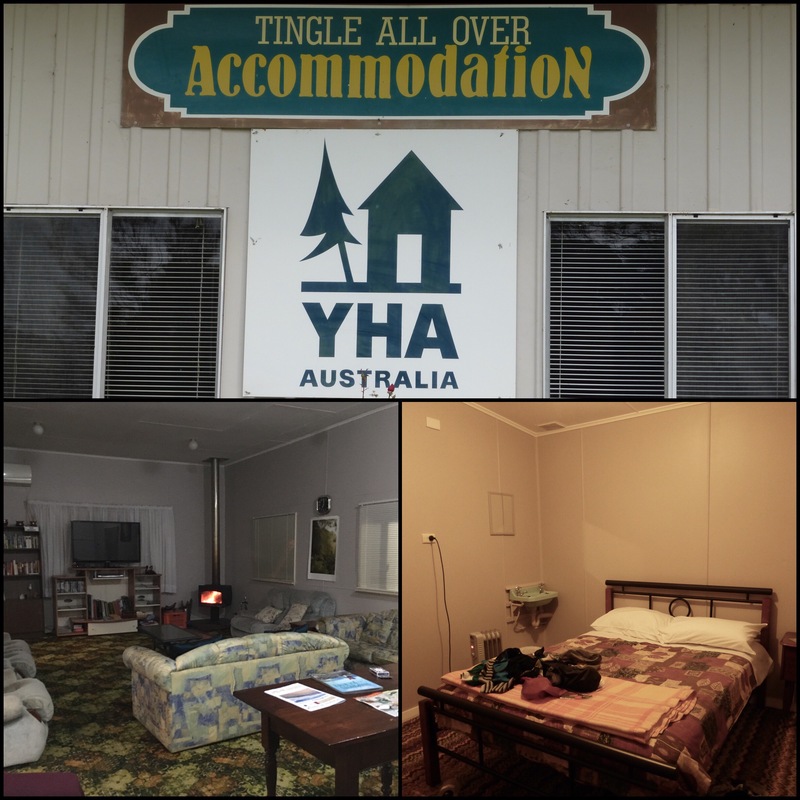 I stayed at the local YHA Hostel called Tingle All Over. How could I not stay there!? The owners here are so great and welcoming and the space is quiet and quaint. I got my own room again and have found it’s usually worth it for me to do that rather than being in a group dorm room. There are some other tourists and I chatted with someone doing a bike tour and another one riding the Munda Biddi, which parallels and sometimes overlaps the Bib. Whew, what a day with so many things and none of them were rain! Well, it did rain after I got to town, but I’m going to let that one slide. I’m up later than I’d like getting the blog and correspondence done. I’m in the lounge area with a toasty warm fire and computer all to myself. My hope is to watch this week’s Survivor and Greys Anatomy if I wake up early enough tomorrow morning. I can feel that I need sleep, so I will try to show some self-restraint and not stay up late watching tonight. I don’t want to get my hopes up too much, but weather looks darn near great for the coming week (still some rain possible)…especially for my final few days! Oh boy, oh boy! They are so nice and accommodating here! Beautiful day for you today and anxious to go with you along the coast. Looks beautiful and the Red Tingle tree sounds intriguing. No foodie picture from town..haha. Nice to have a room and let it rain itself out for the day. Ha! I thought about it at the time and just let it go. Been really enjoying your End to End journey, as well as your posts about the Larapinta Trail. 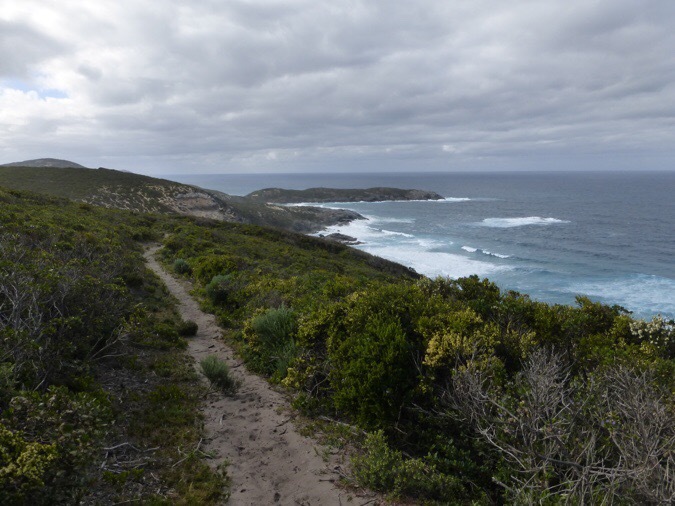 Reading your last few days from Northcliffe to Walpole made me glad we didn’t do this section a few weeks ago – we walked Balingup to Pemberton instead, and will be doing the Northcliffe to Walpole section in Autumn next year (we are doing a sectional End to End). You’re heading for my favourite section of the Track now too (Walpole to Denmark). 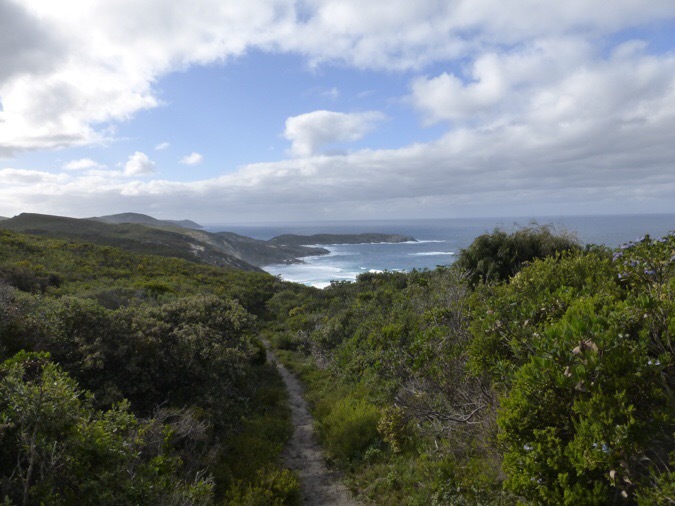 Regarding the fact you haven’t seen many people doing long stretches – I think you are going to catch up with a few End to Enders we walked with from Balingup, as well as a couple we know doing Albany to Pemberton. 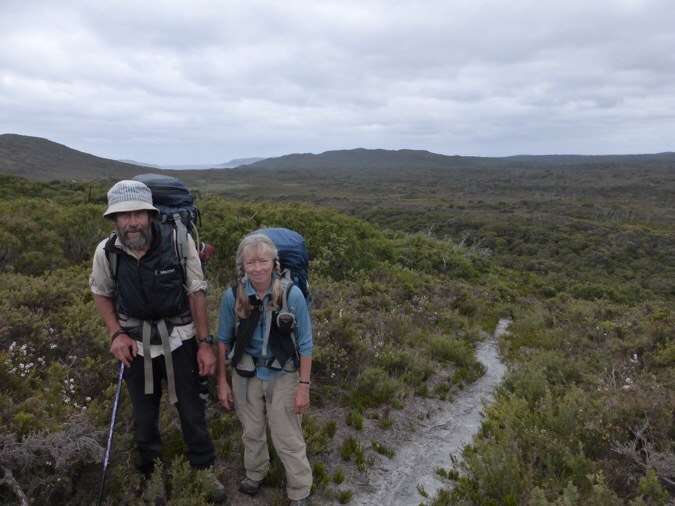 Keep and eye out for Jerry – older guy with a big pack… he’s done Te Araroa and is doing a Bibbulmun End to End. He might be walked with a Danish lady named Helle who started in North Bannister. They might be walking with Peter and Sonya still, who are also doing an End to End but may have different zero day locations planned. The couple coming the other way are Mitch and Ellie. All of them are nice and friendly people – say hi to them from Alissa and Don! I’ll keep an eye out. I don’t recall noticing them in the logbook in the immediate vicinity. Beautiful terrain above the ocean. Sure can’t beat that. Glad all is going smoothly.